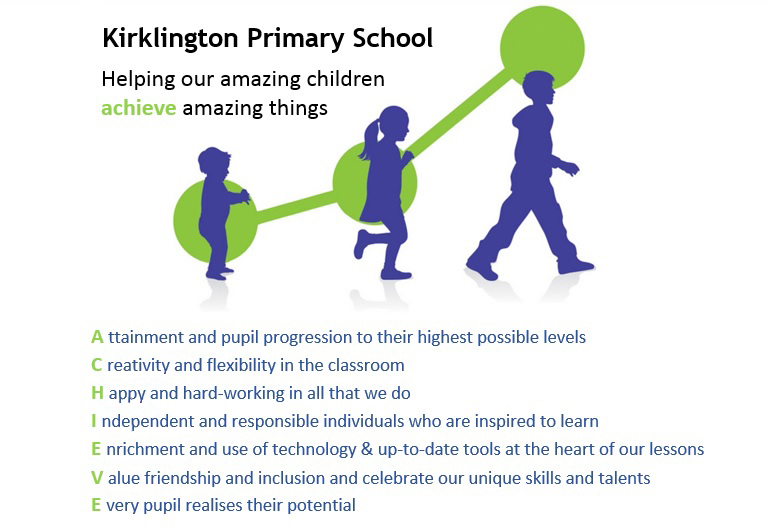 We aim to ensure that pupils leave Kirklington Primary School having unlocked their potential in finding their unique skills and talents and with a sense of their own individuality and independence. We teach children to challenge self imposed restrictions, foster high aspirations and encourage positive self esteem. We want our children to be happy and confident in themselves and also secure in the knowledge that the world is at their feet. We aim to motivate and inspire pupils through creative teaching which is innovative, full of enrichment and uses the most up to date teaching methods and technology. Due to the small size of our school the environment is inclusive and nurturing; we are adaptable and flexible in all that we do. Importantly we are able to tailor our teaching to the individual needs of the pupils. We expect children in our community as a minimum to reach age related levels, in line with national standards and ensure that the barriers to learning are removed so that every pupil realises their full potential. We strive for our school environment to be a happy and hard-working one; where friendship and inclusion are valued and pupils take responsibility for their own actions. Information about our Governing Body can be found here.